Both suffered losses at Austin Country Club in Texas today. SEVENTH-RANKED RORY McIlroy and five-time major champion Phil Mickelson have been ousted from the World Golf Championships Match-Play with losses in Friday’s final group-stage matches. US 18th-seed Brian Harman never trailed in dispatching McIlroy 5&3 and capturing his group with two wins and a draw to qualify for the round of 16 knockout stage on Saturday morning. McIlroy managed only two birdies in his final competitive tuneup for the Masters, which begins in two weeks at Augusta National. It’s the only major title the Northern Ireland star needs to complete a career Grand Slam. American Charles Howell rolled unbeaten to his group crown by downing Japan’s Satoshi Kodaira 2&1 after Mickelson, ranked 18th, kept his hopes alive by edging Spain’s Rafa Cabrera Bello 1 up. Thailand’s 28th-seeded Kiradech Aphybarnrat also booked a berth in the last 16 with a 4&3 victory over Spanish third seed Jon Rahm, who had already been eliminated and finished the week winless. Two-time Masters champion Bubba Watson booked his place in the knockout round by halving with fellow American Julian Suri, the 64th seed. Watson birdied the last two holes to avoid a defeat which otherwise would have seen last man in the field Suri advance. Email “McIlroy and Mickelson out of WGC Match Play after group stage defeats”. 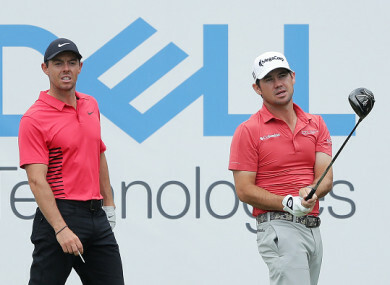 Feedback on “McIlroy and Mickelson out of WGC Match Play after group stage defeats”.